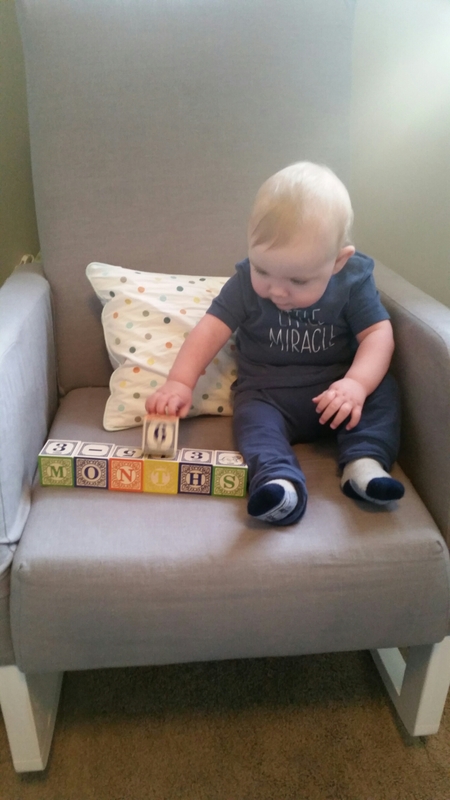 I have a 6 month old!!! Wow. It feels weird to say that. Is in the majorly distracted phase. Mommy struggles to get him to eat or nap as Wyatt just doesn’t want to miss out on anything. Crawled backwards once but Mommy thinks it was just a fluke. Dealt with dermatitis on my face which everyone told me I wouldn’t be able to treat naturally, but I did! Had an excellent physio appointment where she signed off on my lady bits being in tip top shape (once again, never the same but healed). For more photos and videos, follow me on Instagram. You have yelled at your husband 3 nights in a row before bed. It finally makes sense why they say the first year after a child is born is trying on your marriage. You realize it takes full commitment and communication from both sides. But, you are feeling unloved, unheard, unappreciated. Ugh, is it really us or could it just be tomorrow’s full moon? You look in the mirror and see no make up, a Mom bun and sweats. You don’t even know what it feels like to wear dress clothes anymore, let alone shoes that aren’t Sanuks. Your hormonal/viral induced rash is almost gone. How come no one told you about all these wonderful ”benefits” of being postpartum? You are sitting in your car in the driveway, listening to Coffee House tunes, drinking a tea while your baby sleeps in the back seat. This is the closest you’ve felt to normal all week. Except for last night when you stayed up until 1pm to help a friend with their website… Yes, you are on maternity leave but you relish any opportunity to use your brain beyond baby life. Especially because they are simple and the rest of life seems anything but simple these days. Wyatt’s moving more and more every day. Yesterday, he figured out how to back crawl or maybe it was shimmy – either way he’s progressively moving his way around the room. I need to find baby gates before he’s crawing! 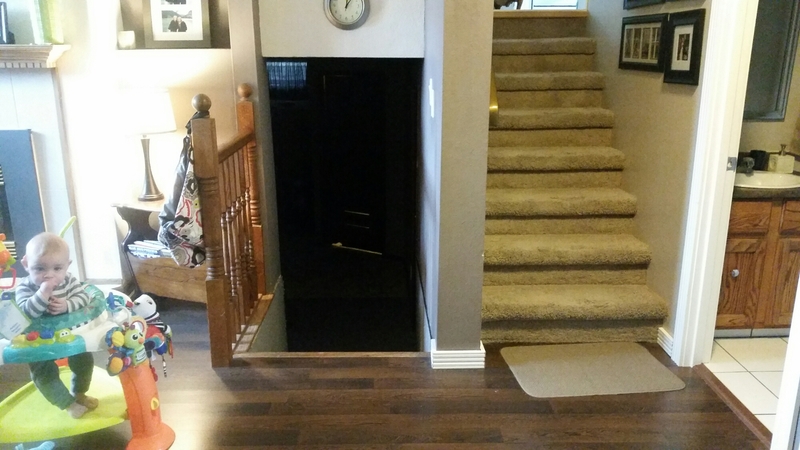 We live in a 4-level split home with 3 staircases. 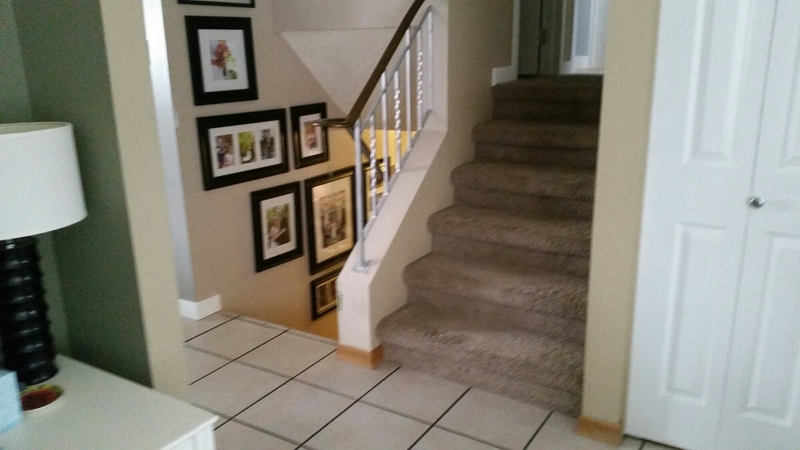 Our main hallway features side-by-side staircases with an older railing. There isn’t much to hold a tension-style gate, nor is there much to fascine a permanent style gate to. A new railing has been on my wish list for a few years now, but is highly unlikely to happen anytime soon. Yes, that’s a cat toy hanging from the railing. We opted for self-serve play time once Wyatt arrived. 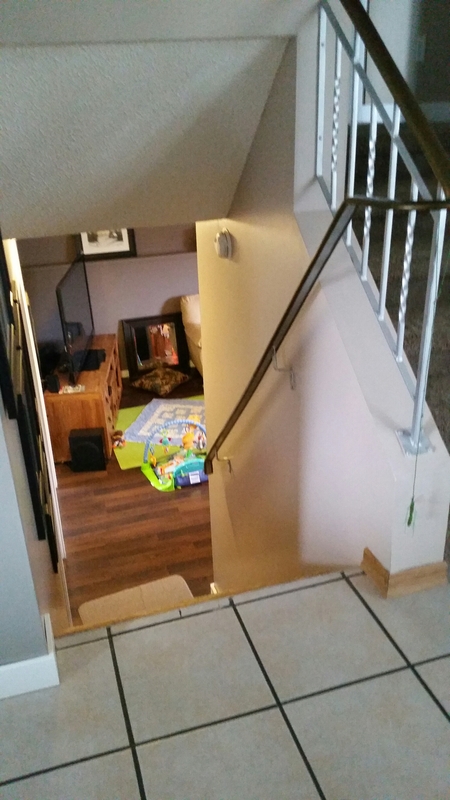 Our lower level may be an easier solution as it has a fairly standard railing on one side. We may need gates with a pet door. Our chihuahuas will go outside, but they are also pee pad trained. Their pads are in the basement, same with the cat’s litter box. I’ve put up a tension style gate at the bottom of the 3rd level stairs to keep the dogs contained a few times. Oliver the cat can jump over it to go to his litter box, but sometimes he gets lazy and meows for me to lift him back over. Anyway, the pet gate isn’t a MUST have feature. I’m willing to adjust our routine and/or pet bathroom location if necessary. I’d prefer tension style. My husband will cringe if I have to put holes in the walls, BUT if that is the best solution we will go for it. 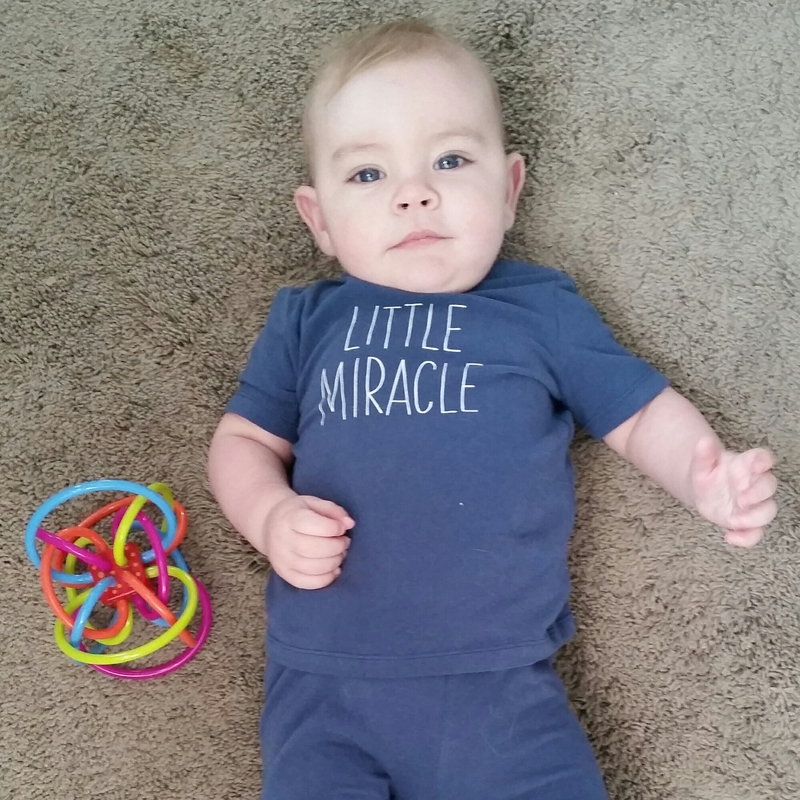 My biggest challenge with motherhood has been adjusting to a slower pace of life. I used to be a go-getter. I love organizing. I love a clean home. I love planning projects and following through with them. Being a Mom means everything takes THAT MUCH longer. Today it is an amazing 19 degrees Celsius on the Canadian Prairies. 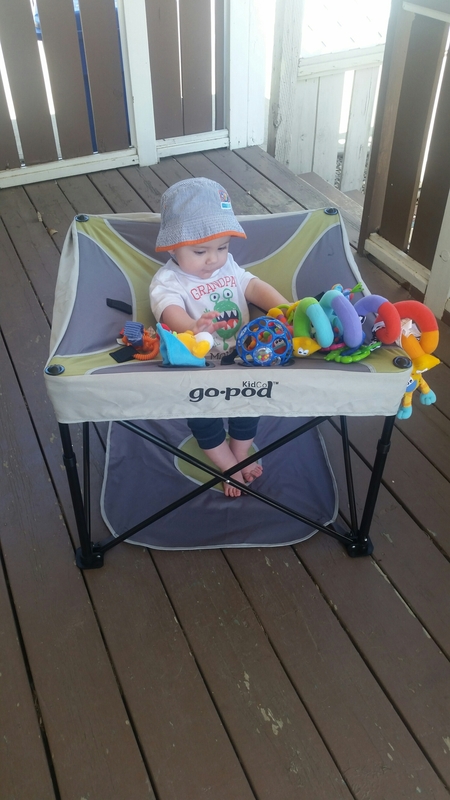 I grabbed the little man and headed into the backyard to enjoy the sun. Leaves to be raked. Piles of branches to be rid of. Gardens that never got weeded before Wyatt came last Fall. A shed messily full of patio furniture which means I can’t even get my gardening gloves out. A deck that needs to be repainted in a last ditch attempt to make it last a few more years. A fence that needs repairs so our genius chihuahua Bella will stop escaping. When will all of this get done? My husband is not a go-getter. It take persistent nagging to get him to do major household tasks. So, I took a deep breath and made a to-do list. I numbered it in order of priority. And then I reminded myself that right now my son doesn’t know any different. The leaves don’t matter to him. He won’t notice the chipping pain. All that matters is exploring, learning and enjoying his days. For now, I can ignore the disaster. We waited years for Wyatt to join us. He deserves my time and attention. His needs are the priority and the yard work will get done… eventually.